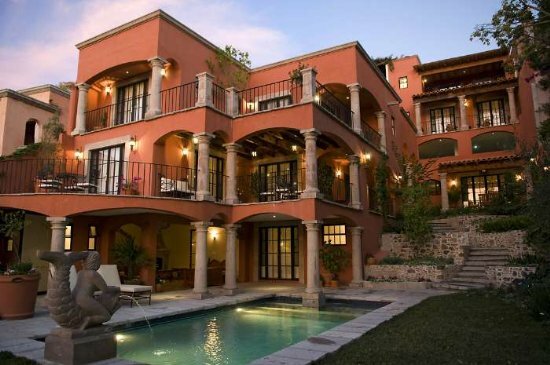 Feel pampered in this large, centro, comfortable colonial home overlooking San Miguel de Allende. Beautifully furnished, and yet so comfortable. Relax in locally made mesquite furniture displaying art by local artisans. This spacious home is a relaxing, two blocks from Park Juarez and four blocks from the Jardin (the main square in town), and it is located on one of the most famous streets in San Miguel. Each of the five bedrooms enjoys private balconies with spacious bathrooms and closets that include a safe. There is one additional full bathroom by the swimming pool in the jardin and two half bathrooms to be shared. 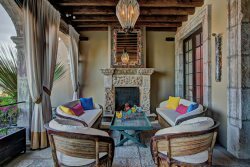 With five fireplaces, and multiple terraces there are many cozy places to sit, relax and enjoy the sites and sounds of San Miguel. Enjoy the well-equipped, stylish new chef's kitchen to include a commercial oven/stove and pizza oven. Listen to the many church bells, smells and sounds of San Miguel as you relax in one of the many outdoor patios or by the comforting sound of the waterfall from the swimming pool after drinking in� San Miguel. This home is stocked with assorted books, novels, DVD's, has cable TV, and is a 3 minute walk to the historic downtown. Enjoy art galleries, antique shops, gift shops, and fine dining. Go on one of the many day trips to Guanajuato, Pozos, Dolores Hidalgo, hot springs, or enjoy the comforts and views of Casa Chorro Fleur de lis. A peaceful, friendly oasis in today's fast-paced world awaits you here. Enjoy the new day watching the hot air balloons fly across the city in the morning, or relax during the sunset.